1. Soak rice and dhal for few hours and grind with all other ingredients and salt to fine batter. 2. Ferment it overnight. The next day. 3. Batter consistency should be like rawa dosa. 4. Add the onion, channa dhal, coriander leaves, Season with mustard and curry leaves. Mix well. 5. Heat the skillet and pour a ladle full of batter starting from the edges in circular way. 6. Since the batter is loose it automatically fills the middle part , unfilled part just fill it with ladle. 7. Add 1 tsp oil, when it turns slight brown in the edges flip it over and make crisp on other side too. 8. Serve it with dhal or chutney.. 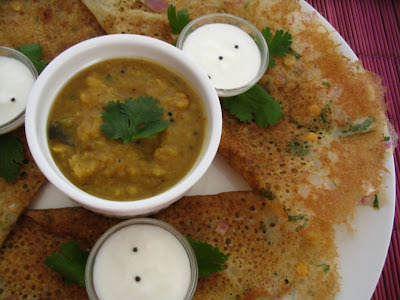 Serve hot even the dosa will taste good after some time but cannot expect the roast. 1. While making each dosa mix batter well becos the onion and channa dhal will settle at the bottom. Mix well and pour it. 2. I used to do this with iron skillet which is deep in the middle but even u can do it in non stick and make dosas like rawa dosa. Comes out so good. REcipes passed on from grandmother's are treasure isnt it? Looks very nice. the dosa queen is back with a bang!! Love it! Never heard of Curd dosa!! I love dosa in any form!! 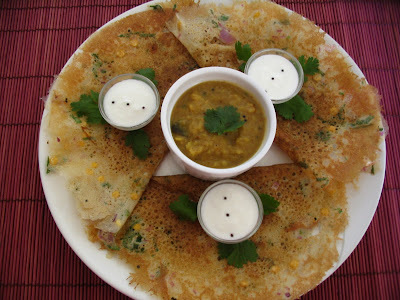 Crispy dosas looks prefectly liks rava dosa...tempting! I prefer crispy dosas so for me this is heaven!! Wow Pavithra, this dosa is my next try for sure. will let you know the outcome for sure. 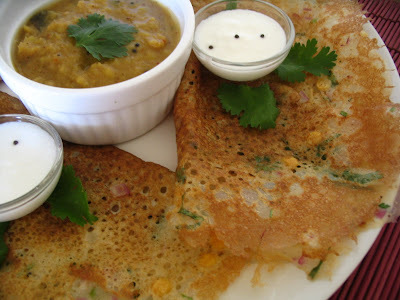 That looks so good.. almost like a rava dosai and the curd must make it nice and tangy. Absolutely love this Perugu dosa. Looks very traditional n tasty. Dosa pictures are also inviting. Wow these looks yummy and would love to have them for breakfast. 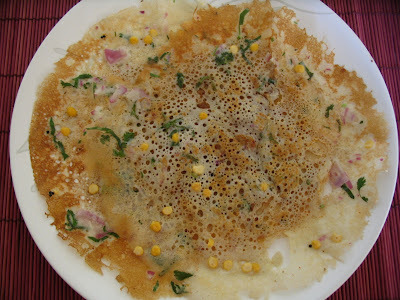 I wud say this is the best dosa pic i have ever seen...the crispness is so evident.Looks very good.I am gona soak some rice now....breakfast for tomorow.thanks this is realllllllly very good! dosa seems to be ur speciality!! Pavi-you ALWAYS come out with such yummy dishes and excellent snaps and presentations to match the dish!!! Interesting recipe. As always nice presentation dear:). Wow crispy dosa! Looks delicious! ur perugu dosa is mast as usual yaar! yogurt dosa sounds different but i'm sure is yummy. As usual ur presentation makes it super yummy. wow must be very tasty with that curd taste and flavor looks delicious.A looks so beautiful pic. Thanks everyone for ur lovely comments and encouragement.. Very interesting...how some small additions change the look of an otherwise common dish. Photos look yummy. You have a nice blog here. Cheers!